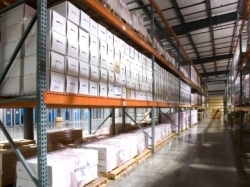 SoftFile offers long-term box storage. SoftFile understands that large volume document scanning (your backlog) is not practical for every customer. Through document storage at SoftFile, we offer on-demand document conversion services. As a document storage customer, you can simply email a request for a particular document and within a short time, simply download the requested document in electronic format from SoftFile's secure website. For our document conversion customers, SoftFile offers document shredding and destruction services. SoftFile maintains an industrial-grade document shredder which is operated in-house (at SoftFile's facility), not by a third party. SoftFile's shredded paper is further hydro-pulped for use in recycling. 44,000 square feet of space. We have our own industrial shredder on site, as well as our own courier service.